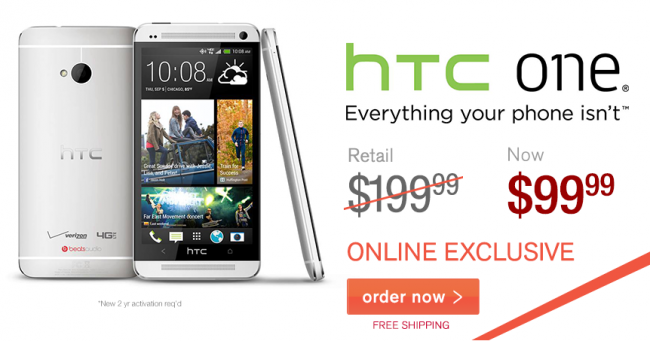 Forget about the colllloooors, and fontssssss, and casssesss, J-Lo and her Viva Movil stores have the best deal we’ve seen thus far for the HTC One on Verizon. For a limited time, and as an “online exclusive,” you can pick up HTC’s recently launched flagship for $99 on new 2-year contract. Verizon is currently selling the same phone for $199, while other 3rd party retailers are coming in somewhere around $150. So yeah, Viva Movil! On a related note, I walked through part of the checkout process with an HTC One in my cart, and was given the option to “keep my existing plan.” As you probably know, I’ve been hanging onto unlimited data with the best of them, so it’s almost leading me to believe that you can keep it if you use Viva Movil. That’s not confirmed, as I did not walk-through the entire process. At some point, they could kick you off and force you onto a tiered data plan. Definitely proceed with caution. With Verizon’s new Share Everything plan, unlimited data is no longer available. If you upgrade a line that has an existing unlimited data plan, you will lose unlimited data on that line. But should you go through the process and buy from Viva Movil, let us know how it goes.